?How can a car’s black box help my car accident case? ?Is the driver in the rear always liable in a rear-end collision? When a driver swerves off the road and hits a tree, he will likely suffer injuries and face increased insurance rates. In these kinds of accidents, known as single-vehicle crashes, fault is typically placed on the driver since he was the only person in charge of the vehicle. However, there are cases in which fixed-object accidents can result from causes outside of the driver’s control. According to the Insurance Institute for Highway Safety (IIHS), about 20 percent of fatalities in motor vehicle crashes are caused by vehicles striking a fixed object at the side of the road. Crashes most commonly happen at night and involve vehicles striking trees, utility poles, and traffic barriers. Drivers. If another vehicle suddenly swerved into the victim’s lane and forced her off the road and into a tree, the victim may pursue a case against that driver. Or if a homeowner placed a trailer or shed too close to the road, or a construction company left debris on the road surface, a driver could seek compensation for any injuries suffered in an accident with them. Passengers. 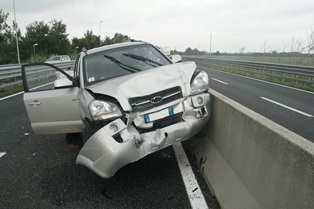 Under Rhode Island fault laws, an at-fault driver can be held responsible for the costs of a car accident. If you were injured as a passenger in a single-vehicle crash, you may be owed compensation under the driver’s insurance policy, your own insurance policy, or through a third-party lawsuit. Many fixed-object crashes result in a rollover, and this can cause severe trauma to the passenger or passenger ejection from the vehicle. Additionally, a third party may be held liable for causing the wrongful deaths of passengers if a defective vehicle component led to the fixed-object collision. Surviving family members could have a product liability case against the manufacturer. After a fixed-object collision, the attorneys at Kirshenbaum & Kirshenbaum can help you get payment for your medical bills, lost income, and other expenses—and we do not charge for our services until your case is resolved. Contact us today via our online form to schedule your initial consultation with a personal injury lawyer.